We wrote this 9 years, 6 months ago	(7/10/2009 : 3:58 pm) and filed it under BigRedCircle. It is a thing of beauty but it is also subjective…but as you created it then it is also correct. As I am a non-coder it affects who I think the best speakers were. 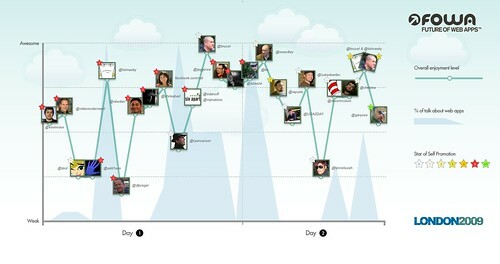 My top three were Simon Wardley, Osama Bedier and Chris Thorpe. I agree with your least favourites though apart from Lynne Luvah. Great work.